Many of us will do whatever it takes to simplify the rote systems and processes that we have to accomplish on any given day – this is why many of us subscribe to different philosophies of GTD and try many of the different and varying mobile and desktop applications that help us accomplish things faster, better, and smarter. It’s those types of applications that I really like coming into our inbox since time wisely-saved is time available for more fruitful endeavors! 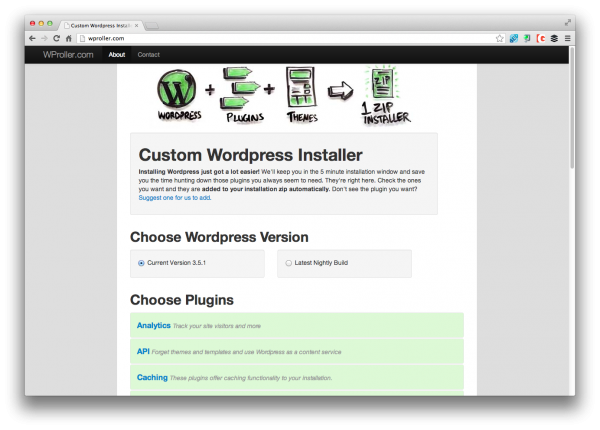 Chris Chaudruc is a man to be thanked because he’s created the first iteration of a new WordPress-powered serviced that will help a user choose from many popular plugins and themes and have them automatically added to their WP installer zip. Think, for a moment, how many times you’ve downloaded the WordPress install zip and then went on to find all those plugins and themes for your client. Then, think about how more quickly it can be done. With WPRoller you can choose the current version of WordPress or even the latest nightly build and then go on to choose the plugins and themes you want in your customized installer file. Analytics? API? Caching? SEO? Sure, it’s all there. Hit that “Roll it Up” button and you’re good to go. Such a simple concept that’s done exceptionally well and saves a truckload of time. Chris is adding dozens of new resources every day and is even toying with the idea of uploading your own zips, links to Git, and SVN repos to load in plugins and other such goodies. Killer work Chris and thanks for it. I’m bookmarking it right now.